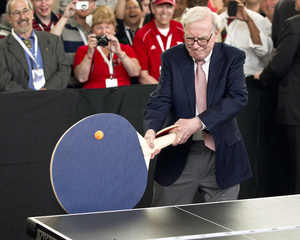 Don't know the back story, but billionaire Warren Buffett played a game of ping pong with that paddle at the most recent Berkshire Hathaway stockholder's meeting. Jay-Z + Kanye West - "No Church In the Wild"
G.O.O.D. Music Chief Keef Remix - "I Don't Like"
Nike LeBron 9 P.S. Elite "South Beach"